It's a great thing that the Rev. 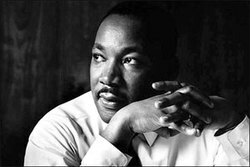 Dr. Martin Luther King is acknowledged each January with a holiday in his name. There are thousands of events around the country remembering his work, and calling for renewed efforts for a more just and better world. But I have mixed feelings today, and it has to do with how Dr. King is being remembered. As a songwriter and a trained historian, I traffic in memories, and am aware of the tricks that memory plays. Looking at all the countless schools, hospitals, and streets named after Dr. King, and the politicians of all stripes spending today giving speeches in his name, it would be easy to believe that Dr. King was a widely beloved figure in his own time, and that the country was squarely on the side of his ideals. Without the sugarcoating of selective memory, the truth is that Dr. King provoked and unsettled the conscience of the nation. He was not beloved in most households in his lifetime. Many wished that he would simply shut up or go away. Yes, he's praised today as a man of peace, and his courage, integrity, and patriotism are now respected by everyone. But in his time he was viewed by many - perhaps most - as a nuisance at best, and at worst a subversive and dangerous agitator, sowing conflict and undermining our nation's way of life. We don't like having our conscience challenged, and we don't like being told that we fall short of our professed ideals and beliefs. It's not easy to become better people. It's a painful process, involving inner conflict, self-examination, sustained effort, and the help of those around us. Dr. King demanded that we become better as individuals, AND as a society - meaning, our laws and institutions had to change too. It is right that we now remember and thank Martin Luther King, Jr. But his most difficult teachings, about nonviolence and our reciprocal obligations to one another, are still not popular. Our best thanks would be to embrace them, and embrace the unsettled feelings that come with them. Who, or what, unsettles your conscience?